Prices on the postwar black market weren’t just a product of supply and demand. Demand for almost everything was high, supply low. There were price fluctuations for some products, especially fresh food or grain. Otherwise, prices staid surprisingly constant, even between different cities and their different black markets. Professional black marketeers – called Schieber — grew powerful enough to set stable prices for many goods. These big racketeers ran organizations of small-time black marketeers who did the footwork. During the hunger protests in 1946 and 1947, Germans harangued against the Schieber for setting prices too high. “Hang the Schieber!” they wrote on their signs. The Schieber grew fat and wealthy on the backs of the common people. Yet the black market was the only truly functioning economy. No one had a choice but to pay the market prices. I’ve gathered many examples from my research, which show just how horribly expensive the black market was. First, keep in mind the average worker might earn about 150 marks a month in postwar Germany. I have searched for a long time for information like this and found very little until today. Thank you for such a good source! I lived in postwar occupied Germany from late 1946 until spring of 1948. My mother, little brother and I arrived on the first plane load of US Army dependents to be joined with their fathers. We lived in a German neighborhood, next door to a German doctor, his wife and two daughters about my age. 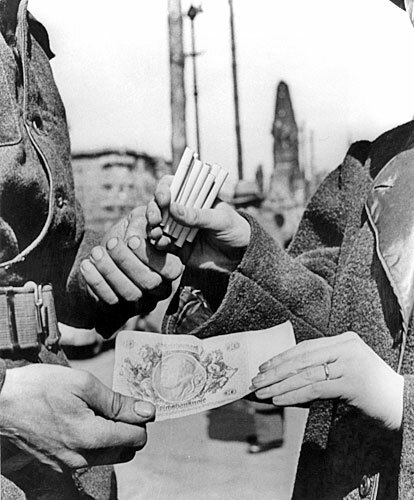 Blackmarket trading was an everyday way of life for many German citizens for survival, and to have any “luxuries” like cigarettes, sugar, and coffee. I once visited a DP (displaced person) camp with my mother, and she brought two women (one Russian and one Polish) into our home who had no place to go and health issues. As a warbaby, and first-hand observer I could tell volumes about Germany (from a five-year old’s perspective, and my mother’s stories over the years).